Today as part of the blog tour for Glimpse by Kendra Leighton, I have a quick Q&A with Kendra, who kindly took some time out to answer a few questions for me. 1. Glimpse is your debut novel. How excited/nervous are you to see it finally released into the world? I’m an equal mix of both! I’ve had this story in my head for so long, and it feels surreal that it's finally going out into the world. 2. How long was the process to go from idea to having a book in your hands? Quite a while — almost exactly five years. It took me six months to write a first draft, then three years before I was happy with the story. I kept rewriting and rewriting until I felt it was ready to send to agents. Then, once I had an agent and a publisher, it took another year and a half to see it in print. The version of Glimpse being published today is very different to the Glimpse I originally wrote, in a good way! 3. In Glimpse, Liz is haunted by Zachary. If you could choose to be haunted who/what would it be and why? 4. If you could meet one of your characters in real life; who would it be, why and what would you say to them? I’d meet Meg, the cranky village psychic. She’d have some amazing stories to tell. I’d also love to hear her take on what happens at the end of the novel! 5. The cover for Glimpse looks very haunting, did you have any input into the design in anyway? Like a lot of authors, I wasn’t involved in the design, so it was a wonderful surprise when my editor emailed it to me. I think the designer did an amazing job. I especially love the title font, and the moon on the spine. 6. Did you do any research to prepare for Glimpse, like maybe visiting a haunted house? I visited The Spaniards Inn in London, which shares some things in common with the inn in Glimpse — it used to be frequented by highwaymen, is about the same age (dating from the 1500s), and is rumoured to be haunted. I also read up on eighteenth-century highwaymen, and followed someone called ‘Rakish Highwayman’ on Twitter! 7. Can you share with us a few of your favourite lines (spoiler free) from Glimpse? 8. 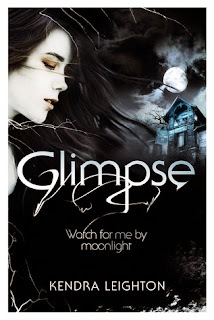 What are you doing to celebrate the publication of Glimpse? I’ll probably spend most of the day glued to the internet, nervously eating everything in sight! Then in the evening I’m having a bit of a launch party. I have lots of people to thank—family and friends who read early drafts, and people from my agency and publisher who worked on the book—and I’m really looking forward to celebrating Glimpse’s birthday with them all. 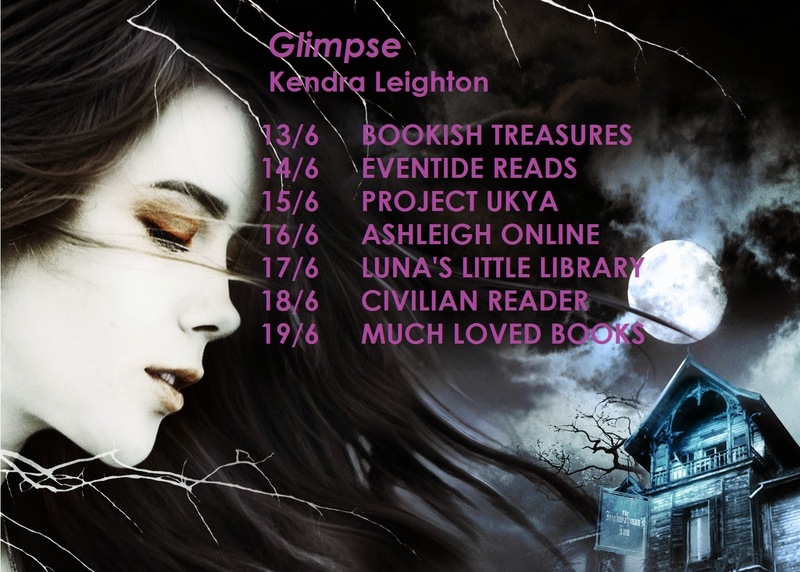 Glimpse is available to buy on 19th. To find out more from Kendra, you can find her at her website, twitter, and facebook page.